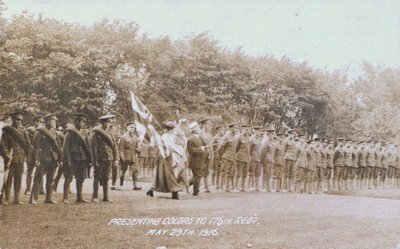 A postcard of "Presenting Colors" to the 176th Battalion (Regiment), May 29, 1916. The 176th Battalion (Niagara Rangers) left for Britain on April 29, 1917. Upon arrival in England the battalion was absorbed into other reserve battalions. While the postcard says the 176th Regiment, it was properly known as the 176th Battalion. In World War One, the existing regiments were not mobilized. Instead the Canadian Expeditionary Force was created and organized into battalions, each given a number. It appears here that Regiment and Battalion have been used interchangeably. The Battalion (Regiment) was disbanded in 1920.